2015 Honda Ape 50 Type D. Picture credits - Honda. Submit more pictures. 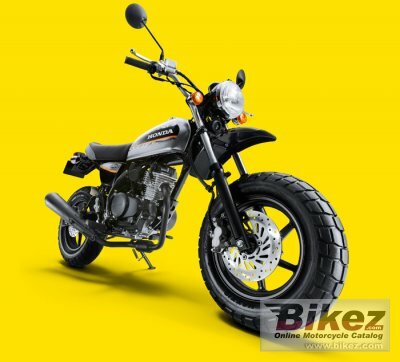 The �Ape100�, a new mini sports bike for Japan�s Type II (50-125cm3) licensing category. Features of the Ape 100 include a powerful 100cm3 air-cooled 4-stroke OHC single engine, a motorcycle-type 5-speed transmission offering the sort of handling and control enjoyment associated with larger motorcycles, and friendly, approachable styling. Ask questions Join the 15 Honda Ape 50 Type D discussion group or the general Honda discussion group. Bikez.com has a discussion group for every motorcycle. Here you may find answers to common questions about the model. If you do not find what you are looking for, you can ask questions. Try out the 2015 Honda Ape 50 Type D discussion forum. You can sign up for e-mail notifications when other users answer you. If you have information about any technical issue related to this motorcycle, please leave a comment for other riders.